Amy Buller's Darkness over Germany was first read by Queen Elizabeth, later the Queen Mother, in 1944. 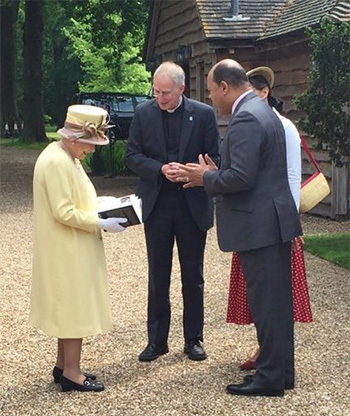 On 5 June 2016 Professor of Journalism Kurt Barling presented Her Majesty The Queen with a copy of a brand new translation of Amy Buller’s Darkness over Germany that he recently edited. It was feared the book, last printed in English in 1945, had been confined to history but not only is it being reprinted but, for the first time, has been translated into German with an extensive historical introduction written by Professor Barling. Darkness over Germany (Finsternis in Deutschland), Buller’s only book, offers telling insights into the relationship between Britain and Germany right up to the outbreak of war in 1939. Queen Elizabeth, later the Queen Mother, first read the book in 1944 when she met with the author to discuss what she hoped to achieve with the book. "I hope it will give German readers an insight into the way some of the English were thinking about the future of Germany while Bomber Command was pursuing its air bombing campaign," Professor Barling said. "It reminds us that war is not just kill or be killed, but that there has to be a plan of how to deal with the peace before victory." Die Stern German newspaper has called it "an important book, finally in German”. A new English edition of the book will be published in March 2017. Read more about the book's history and its relevance today.